Ignatius Press has announced that "Pope Benedict XVI's second volume of Jesus of Nazareth: From His Transfiguration to His Death and Resurrection will be published in English by Ignatius Press, according to an agreement between Ignatius Press and the Vatican's Publishing House, Libreria Editrice Vaticana." The publication date is set for Spring 2011. For more info on this announcement go here. It is time for another contest! Yes, summer is going by very quickly, and I want to make sure to have at least one more contest before school starts up again. This contest is interesting, I think, because the question has nothing to do with the prize. Also, instead of having a series of trivia questions, I am going to ask you to be creative. So, then, how will I decide a winner? Like I mentioned above, I am not going to ask any specific trivia-type questions this time. Instead, I want you to come up with a proposed new tagline or slogan for the upcoming NABRE. The idea came to me as I was re-reading some of my favorite posts on this blog from back in 2008. As I came upon this old post, I began to wonder if the new NABRE would be publicized using some form of tagline or slogan. Thus, your mission is to come up with a new tagline/slogan for the NABRE, assuming that it will be published in 2011. Feel free to be witty, instructive, or funny, but please do not be mean-spirited. (I will delete any posts that I deem inappropriate.) All answers must be submitted by 11:59 PM on Sunday, August 1. A funeral Mass of Resurrection will be offered for Father Lawrence Edward Boadt, CSP, at 10 a.m. on Wednesday, July 28, 2010 at the Church of St. Paul the Apostle, 60th Street and Columbus Avenue in New York City. Visitation and wake will take place at the church from 2-5 p.m. and 7-9 p.m. on Tuesday July 27. Immediately following the funeral, interment will take place in the Paulist Fathers section of St. Thomas the Apostle Church Cemetery in Oak Ridge, N.J. Father Boadt, a member of the Missionary Society of St. Paul the Apostle (Paulist Fathers) for 47 years, died July 24 after a long illness. He was 67. Born the son of attorneys Loren A. and Eleanor (Power) Boadt in 1942, Father Boadt grew up in the St. Paul the Apostle parish located in the Westwood neighborhood of Los Angeles. Paulist archivist Father John Lynch was newly ordained when he first met Father Boadt, then a fifth-grader in the parish school. Father Lynch recalls seeing the makings of a priest in the young altar server and Cub Scout. “He was dependable and enjoyed serving the church,” Father Lynch said. He noted that Father Boadt kept his close association with St. Paul’s as a student at Loyola High School in Los Angeles; he graduated from Loyola in 1960. Father Lynch was not surprised to hear the young man entered the Paulist novitiate on Sept. 6, 1962. He was ordained a Paulist priest on February 22, 1969. Father Boadt earned bachelor’s and master’s degrees from St. Paul’s College Washington, D.C., master’s and licentiate in sacred theology degrees from the Catholic University of America in Washington, D.C., and licentiate in sacred Scripture and doctoral degree in biblical studies and Near Eastern languages from the Pontifical Biblical Institute in Rome. Father Boadt’s first priestly assignment was as associate pastor at St. Andrew’s parish in Clemson, S.C., from February to October of 1969. 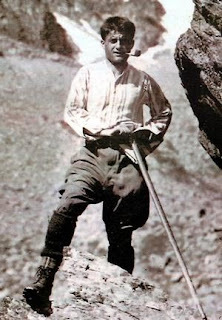 Father Boadt then headed to Rome for advanced Scripture studies where he served on the parish staff at Santa Susanna, the Paulist parish in the city. Father Boadt returned to the United States to teach at Fordham University in New York City from 1974-76 while becoming an editor at the Paulist Press in 1975. He taught at St. John’s University in Queens from 1975-76 while still working at Paulist Press. He returned to Washington, D.C., as associate professor of Sacred Scripture at the Washington Theological Union, where he taught from 1976-1997. Father Boadt continued as editor at the Paulist Press, becoming vice president in 1997. He had served as publisher and president of Paulist Press from 1998 until his illness in 2010. According to Father Lynch, Father Boadt continued the Paulist work of evangelization through the printed word while expanding the Press’ extraordinary contribution to ecumenism and interreligious dialogue, especially Christian-Jewish relations. “Building on the work of his predecessor Father Kevin Lynch, there is no publisher in North America who has done more to advance Catholic-Jewish relations than Larry Boadt,” said Father Michael B. McGarry, president of the Paulist Fathers. Father Boadt authored several books, including Reading the Old Testament: An Introduction, Jeremiah 26-52, Habakkuk, Zephaniah, Nahum, and Jeremiah 1-25. He also edited many titles, such as Why I Am A Priest: 30 Success Stories and The Life of St. Paul. Ever since I was young, I have always had a soft spot in my heart for The Book of Lamentations. Now before you think that last sentence makes absolutely no sense, considering the subject matter of the book, let me explain. When I was attending a local Catholic high school, we were all given Catholic editions of The Good News Bible when we were freshmen. Did we ever actually use it in our religion classes? Rarely! Yeah, truly a shame. (Fortunately, this is something which I am proud to say doesn't happen at the high school I teach, where we are always using the Bible in all the theology courses we offer.) To be fair, there was, however, one religion class when I was in high school that asked each student to lead the opening prayer, with a particular Scripture passage selected, once per semester. Of course, the student was able to pick the passage beforehand, and when you are in a school full of teenage boys, the scripture we often heard ended up coming from Revelation, Ezekiel, Jeremiah, Daniel, or Lamentations. Why you ask? Well, in those books, as well as some of the other prophets, you find lots of passages dealing with the "sword, fire, and pestilence." All of this is terribly exciting for teenage boys. The teacher, of course, shook her head in dismay each day as another student would pick from one of these books, but in the end never did anything about it. In many ways, outside of Sunday Mass, this was my first real interaction with the Scriptures. So, whenever I come upon Lamentations in the Bible, I kind of get the warm and fuzzies. Strange? Probably. So, why do I bring up Lamentations now? 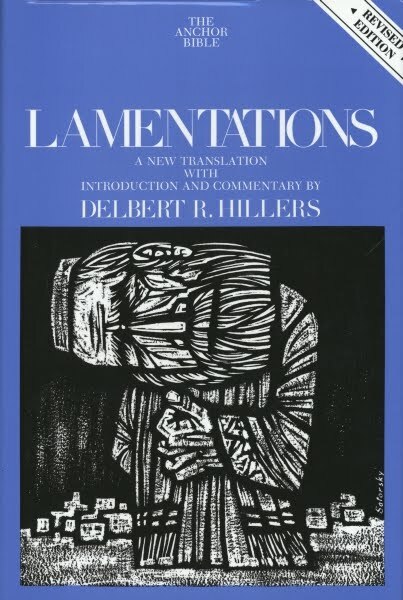 Well, a week or so ago I decided to re-read Lamentations for the first time in a while. As I was reading it, I began consulting some study notes in my NOAB 4th Edition and began to get really interested in doing some more in depth study. In addition, I even proposed leading a 4 week study on Lamentations at a local parish at the end of the summer, which I am waiting to hear back on. So, I wanted to see if there are any particular books or commentaries that I should consult while doing the research and preparing for this possible Bible study. So far, outside of the NOAB, I have been referencing: The Jewish Study Bible, Lamentations by Hillers (Anchor Bible), and Jeremiah 30-52 and Lamentations by Bracke (Westminster Bible Companion). The works I have been using have been primarily concerned with critical/historical/literary issue, but I am also looking for recommendations focusing on Christian interpretation. Maybe something that examines how and why Lamentations is used during Holy Week. I am interested to hear in feedback from my fine readers. Congrats to Shazamaholic who correctly answered all the questions. The key question, not surprisingly, was the bonus. The correct answer was either Godzilla vs. The Thing or Mothra vs. Godzilla made in the '60's. Godzilla vs. Mothra technically is the name of a Hesei series of Godzilla films which were made in the 80's and 90's. So, Shazamaholic, please drop me an email with your address, and I will get you prize out to you this week. My email: mccorm45 (at) yahoo (dot) com. This photo is really great for a number of reasons. First off, I am a big fan of the late Charlton Heston. It was only yesterday when I was watching Soylent Green on TCM and viewed the immortal line: "Soylent Green is people!" It's such a '70's film, but still highly enjoyable. The Omega Man is also a solid sci-fi film from that era, which, in my opinion, is still considerably better than the recently released I am Legend. It is amazing when you look at the various roles Heston had, from the classics like Moses and Judah Ben-Hur to Andrew Jackson, Michelangelo, and, of course, Colonel Taylor in Planet of the Apes. And that is just to name a few! However, the second, and probably most important, reason for posting this picture is to discuss the role of digital media in the world of Catholic Bibles. I have to be honest up front, while I do own an I-Phone which contains an edition of the NRSV on it, I rarely use it. Perhaps the only time I do is when I need to find a passage quickly, without the help of a concordance. Yet, I do recognize that products like the IPad and Kindle are becoming more and more popular these days. They also provide the ability to have access to a whole host of study aids right at your finger tips, both downloaded and online, which is not possible with a regular old book. Still, I prefer to read from a book. Even now, if I need to read a longer article or report that can only be found online, I tend to print it out instead of reading it off the screen. But hey, that's just me. 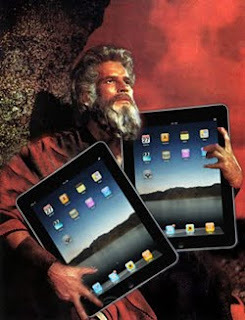 So I ask, has anyone made the switch to digital readers for the daily Bible reading and study? Those of us who need to read the Bible in translation sometimes struggle in deciding on what translation to use. I maintain, as do most people, that it is always good to refer to different translations, particularly when doing serious Bible study. With that being said, we still all have our preferences or favorites. Some people are very staunch in their Bible of choice, while others may be using the same Bible that was given to them at an important event in their life as a Christian, like Confirmation. As I have mentioned on this blog before, one of the most beautiful sights I see when doing Church things is an older person who has dug deep into their Bible, which clearly has been read and loved for decades. (Funny enough, the translation I typically see in these instances is the Jerusalem Bible!). This topic has again entered my mind, particularly as I have been re-assessing the various translations out there, as well as after reading some recent blog entries on other sites. My wife correctly reminded me recently that I have way too many Bibles. Truth be told, that reality has been on my mind for the past few months. One of the options to relieving this issue is to give some of these Bibles away, which I have been doing for friends and co-workers. Yet, even with the ones I have already given way, my Bible library is still in need of a bit of purging. So, instead of selling them on EBay, I am just going to start having some contests, periodically, on this blog in hopes of sending these Bibles to good homes at no cost to the receiver. Of course this allows me to make room for new editions, but let's keep that between us. ;) Of course, the question is how to do it? Well, in the past I have had contests which usually surrounded answering a couple of questions, with the first one to answer them all correct being the winner. Again, I will be following that same model for these upcoming giveaways. The obvious problem is that any form of trivia question is probably going to be easily answered with the use of Google. So, how to fix this? Use more subjective questions that relate to me! Some of them may have nothing to do with Catholic Bibles or biblical studies. Kind of weird yes, but perhaps the only way to open up this contest a bit more. Yes, there will be some questions that can and will be answered via looking it up on the web, but there will be some subjective ones which relate to my likes/dislikes as well as issue relating to this blog. So, lets give it a try! 1) All questions will be answered in the comment box. The first to get all correct will be the winner. If nobody is able to answer all the questions correctly, then I will pick the closest entry. I will probably use the tie-breaker question in that case. No anonymous entries will be accepted! 2) I will announce the winner after the deadline on the blog. At that point, the winner must contact me, via email, within a week to claim the prize. 4) I will pay the shipping cost. It will not be, however, express mail! 1) Knox Holy Bible- Hardbound, (1956*) Sheed & Ward edition which is in OK shape. The binding is in really great shape, but the original slip cover is a bit torn and there is a slight stain on the outside edges. These minor deficiencies do not cause any problems with reading or obscure the text in any way. 2) St. Joseph Edition Pocket Guide to the Bible - Mint condition little pamphlet book from Catholic Book Publishing (1989). 3) Kenneth J. Howell's Ignatius of Antioch: A New Translation and Theological Commentary- Book is in mint condition (2008). All entries must be in by 11:59PM EST on Tuesday, July 20th. 1) In which of the letters of Ignatius of Antioch do we learn about a bishop named Onesimus? 2) Where did my wife and I go for our honeymoon? 3) What was the first single from U2's album Achtung Baby? 4) According to the producers of Gojira, or more commonly known in the USA Godzilla: King of the Monsters, what two American movies were the most influential during the production of Gojira? Bonus Question: What is my favorite Godzilla movie, excluding the 1954 original? * 1956 is the year that Godzilla King of the Monsters was released in the USA. According to HarperOne, the upcoming NRSV thinline, which will come in a Protestant and full Apocrypha edition in the fall, followed by a Catholic edition in 2011, will include both a concordance and maps. Again, the first two versions of this thinline are due out in October. Some of you who have been reading this blog for the past couple years know that I have always wanted a Catholic Bible in a thinline edition. As far as I know, one does not exist in any of the major Catholic, or ecumenical, translations. There have been times when I think I have found something that would ultimately meet my needs, but in the end it didn't. At least for me, a thinline Bible is something that can be used in both devotional, as well as classroom settings. Whenever I have picked up one in the store, I have always liked its size and feel. It's neither too small, like a compact edition, nor as big as a standard, average sized Bible. Of course, in the back of mind currently is the upcoming release of the NRSV Thinline edition by HarperOne, which promises to come in Protestant and full Apocrypha editions in the fall, with a Catholic edition in early 2011. However, I have yet to see any indication as to what this edition will look like or what it will contain. If one remembers, it was only last year that HarperOne released their NRSV Compact Thinline, which ended up being a pretty bare bones compact NRSV. So, we shall have to wait and see what comes of the this. So, do any of you use a thinline? 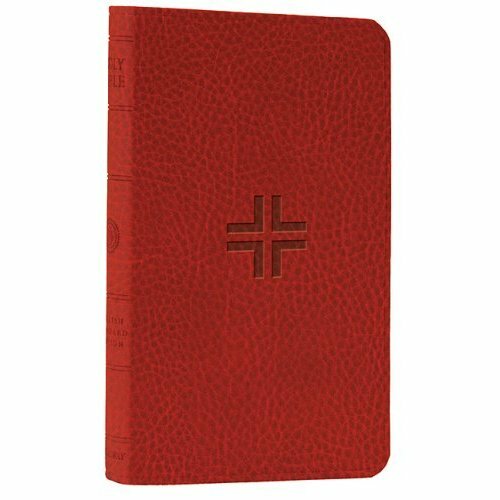 What do you think of thinline Bibles in general? 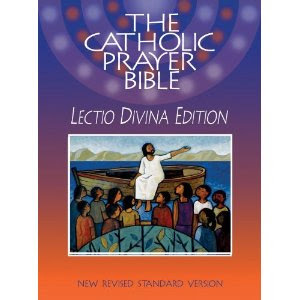 Published earlier this year, the Catholic Prayer Bible: Lectio Divina Edition is produced by the Pastoral Bible Foundation and Paulist Press. According to Paulist Press, this new publication "is an ideal Bible for everyone who desires to reflect on the individual stories and chapters of just one, or even all, of the biblical books, while being led to prayer though meditation on that biblical passage." It comes in both a hardcover and paperback edition, the former including two ribbon markers. The translation used throughout is the NRSV Catholic Edition. One of the best features of this Bible is it's page layout, which, in general, keeps the prose in a single-column format while the poetry is typically in a double-column. I say "in general" because this is only true when there is a "lectio divina box" on the page. Whenever this does not occur, the page resorts back to a double-column format. Fortunately, many pages have this lectio divina box. In addition, there are also bold paragraph headings which are helpful in spacing out the text. This certainly enhances the ease of reading, which is a good thing in a "lectio divina" Bible. The margins are 1/2 inch and on pages where there is single-column text there is even more room to write out one's personal annotations. The picture I took on the left gives you a general view of what each page looks like. Interestingly enough, it occurred to me while I was looking through this Bible that I felt like I have seen this style of font and page formatting before. After thinking about it for a few minutes, I realized that is was very similar to the Catholic Community Bible version that I own. Anyone who owns that Bible (Francesco) will instantly know what I am talking about. I have included a picture of the Catholic Community Bible here for a comparison. On to the main feature of this Bible, which is the lectio divina insert boxes found on many of the pages. Many of you are familiar with the standard four steps of lectio divina: Lectio, Meditatio, Oratio, and Contemplatio. Well, the Catholic Prayer Bible follows another form of lectio divina, focusing on the four steps of: Read, Reflect, Pray, and Act. While I would greatly prefer the traditional four steps, I have seen variations over the years, some even including a fifth part which tends to focus on one's action or response to the text. So, I am not too sure what to think of this. As with anything of this sort, some of the information is good, while others is either obvious or too suggestive. Read: The changing fortunes of the Israelites in Egypt are marked by their transformation into a growing slave population that becomes a source of anxiety to the pharaoh, who works them hard and attempts to reduce their numbers. Two faithful midwives save many newborns, but the threat remains. Reflect: Consider the courage of the midwives in standing up to the pharaoh. Reflect on the ways in which governments sometimes infringe on individual liberties. Pray: Ask for the strength and the faith in God to meet challenges or to work against unjust demands. Many of the other lectio divina boxes have a similar style and outlook to them. (If anyone is interested in what this edition says for any particular passage, just let me know in the comment box. In my opinion, the Catholic Prayer Bible is a pretty good entry level approach to lectio divina. One could argue that it would be better to learn the practice of lectio divina, via a tutor or a good book, and then just apply the steps to individual texts in a regular old Bible. However, if neither of those two options are available, and you are new to the Bible, then this edition could be of some help. Anyone else who is moderately familiar with the Bible, or lectio divina, would probably be OK without this edition. Also, I would think that a concordance and perhaps some additional classical artwork of Biblical passages would be of some benefit to readers. According to CNS Blog, Pope Benedict's book is being carefully translated and will probably not be published until 2011. For more info, check out the news at CNS. It was also suggested that volume II would cover only the passion and resurrection, with a possible third volume on the infancy narratives. One thing I am always on the lookout for, yes it's sad, are books on Bible translations. Indeed, if it wasn't bad enough that I probably have too many Bibles to begin with, I also have an interest in reading about what other people think about Bible translations. So, whenever I see something new, I tend to pick it up. It could be as simple as the Bible Translations Comparison chart by Rose Publication or something a bit more substantial, like the translation books by Dewey, Metzger, or Comfort. I think one of the things I enjoy most about these books are the perspectives that they bring about a variety of the translating issues that translators face. Issues such as gender accuracy and formal vs. functional, as well as how to translate poetry will continue to be debated as more and more English language Bibles are produced. Of all these books, the one I have found the most helpful is How to Choose a Translation for All Its Worth by Gordon D. Fee and Mark L. Strauss. It is one of the newest to be published, most recently in 2007. So, it includes the ESV and the TNIV in the discussion. Needless to say, this book looks quite favorably on the TNIV, of which both authors served on the translation committee. This is, of course, one of those things you need to look out for when purchasing books like this, since there can be a tendency for them to serve as propaganda for their own translations. (More on that later.) Overall, this book is pretty fair IMHO. Instead of a formal or functional translation, they advocate what they term a "mediating" translation. Of those who fit into this, the book recommends not shockingly the TNIV, but also the NET and NAB translations. They also give high praise to the NRSV, which, for them, is a bit too literal, compared to the mediating translations. I also feel their translation spectrum chart is the best one I have seen. It incorporates many of the recent translations in a way which I think does justice to the translation method each subscribes to. I would also recommend Philip W. Comfort's Essential Guide to Bible Versions. Even though it is almost ten years old at this point, it does a pretty thorough job, considering it is a one volume work, analyzing many of the most popular versions. Perhaps most helpful is the full chapter devoted to a comparative study of the prologue of John which references many translations, both Catholic and Protestant. So, how about an updated Catholic Bible translation book? Well, there are various books out there that contain sections devoted to various Catholic Bibles, but it would be nice to have something produced along the lines of Comfort's book. Either way, I definitely recommend picking up one of these books. They have been particularly helpful to me as I have thought about the whole gender inclusiveness issue. I would avoid both of them because they both are way too extreme in their advocating for their Bible of choice. Which Bible Should I Choose? is by TAN and advocates the Douay-Rheims. However, I never found the argument completely convincing, particularly since it fails to address the issues of recent teachings on Bible translations by the Church, as well as looking at what the Church has done with the Nova Vulgata. Again, this isn't a rant on the Douay-Rheims, which I have the utmost respect for, but rather a critique of a position which I don't think can be maintained in the 21st Century. The second book New Age Bible Versions is a real joy to read, simply because it is so over-the-top in its defence of the KJV against all subsequent Protestant and Catholic Bible versions. A good friend of mine found this in a used book sale. He gave it to me knowing that I would get a good laugh at reading not only the KJV-only advocacy but the blatant anti-Catholic chapters. While I must say that reading a book comparing the Catholic Church to Babylon the great is always a fun read, this book's attempt to convince it's readers that the Vatican is Satan's Church due to it being located in Rome on "the seven hills" is a real hoot. Of course, when Revelation 17:9 was written, the Vatican hill wasn't considered one of the main seven hills of ancient Rome. Of course, the seven are the Aventine, Caelian, Esquiline, Quirinal, Viminal, Palatine, and Capitoline. As a matter of fact, the Vatican hill wasn't even located within the ancient city wall. I am always tempted to dump this book, but alas it is fun reading on a rainy day. For more on Blessed Pier Giorgio Frassati, go here.